Here's all the gold, silver and bronze medals that have been handed out at the 2018 Winter Olympics. The PyeongChang 2018 Winter Olympics began Thursday, but the first medals were awarded Saturday. Medals were awarded in biathlon, cross-country skiing, speedskating, short-track speedskating and ski jumping. 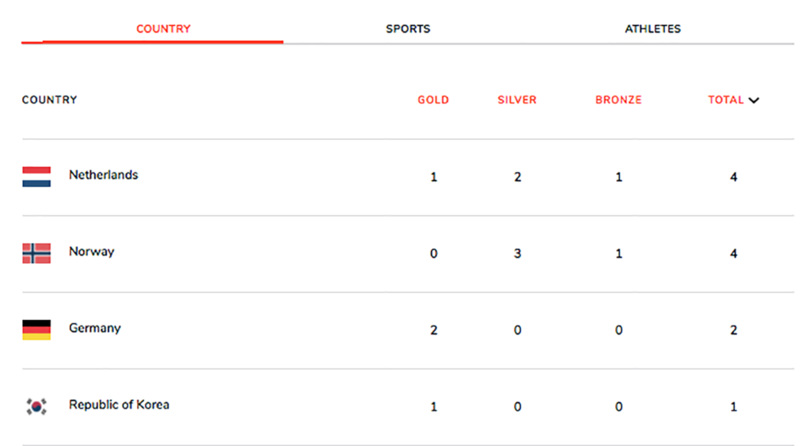 After Day 1, the Netherlands and Norway lead the the medal count with four each. The Netherlands have one gold medal, two silver medals and one bronze medal. The country pulled off the first sweep of the games in the women's 3,000-meter speed skating event — earning the gold, silver and bronze. Norway has three silver medals and one bronze medal, while one athlete made history. Marit Bjoergen, 37, became the world’s most decorated female Winter Olympian with her silver medal in the 15-kilometer cross-country skiathlon— earning her 11th medal across five Olympics. Norwegian ski jumper Robert Johansson failed to earn a medal, his mustache gained plenty of social media attention. Host nation South Korea earned its first gold medal Saturday in short-track speed skating. Lim Hyo-jun earned the honor and a huge home-crowd standing ovation for the storybook moment. Sweden's Charlotte Kalla got the first gold of the entire 2018 Winter Olympics in the 15-kilometer cross-country skiathlon. She and Bjoergen hugged after thier respective wins. Below is a current tally of the medals and a link to Sports Illustrated's medal tracker. See Sports Illustrated's complete tracker here.